Calculus, or the study of change is one of the most important courses in the field of mathematics. Successful completion of this course can propel students into many different endeavors(e.g. engineering, physics, science, and medicine). The main two branches are differential and integral. Some major topics include Limits; Continuity; Derivatives; Integrals and Techniques; Applications; Sequences; Series. Students can struggle with calculus for various reasons. Deficiencies with their algebra, difficulty in setting up problems such as with optimization/related rates, and/or properly following differentiation and integration technique procedures. Math Tutoring Experts assist students in this challenging course by implementing a step by step approach that enables a student to understand what is being asked of them and how to independently reach a solution that leads to higher retention and confidence. MTE provides assistance with calculus during weeknights and weekends. Students can sign up for packages that consists of 4 hour time blocks. Each session can last for 30 minutes or one hour. Group packages can also be purchased to assist students with topics such as Differentiation (Power Rule; Quotient Rule; Implicit) and Series (Power; Taylor). 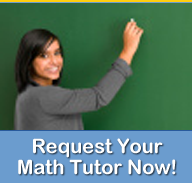 Please contact MTE to begin your tutoring sessions with the premier online mathematics tutoring service.